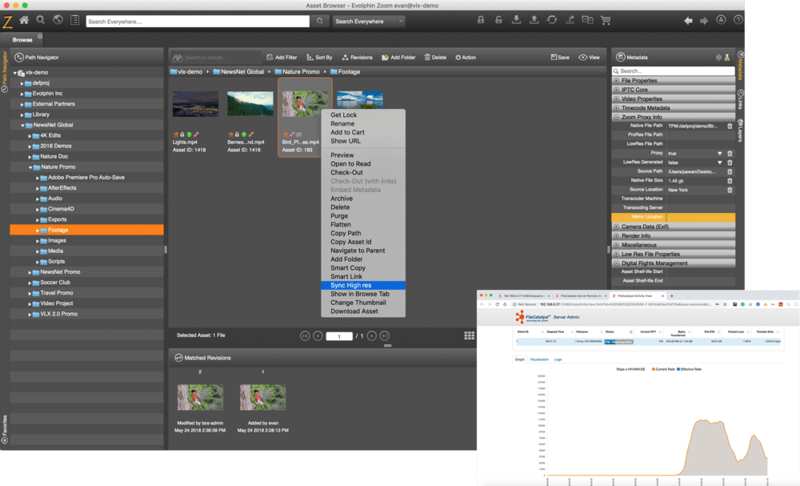 At the 2019 NAB Show in Las Vegas, Evolphin announces a lineup of new features to greatly enhance the workflows of creatives in multiple fields. If you’re at the show, stop by our booth SL10227 in Lower South Hall to see live demos of everything! Artificial Intelligence can do so much more than speech to text and object detection. 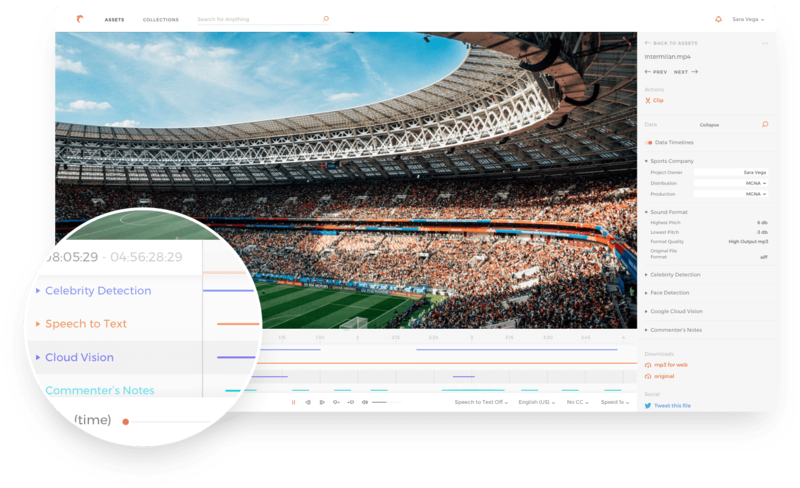 It can analyze the sentiment of videos, extract overall topics, and even identify scenes such as goals and penalties in a sporting event. But all that information returning from AI analysis can be overwhelming, and is often in a format not easily understood. Evolphin came up with an innovative way to solve this. Our AI Timeline View in the Web Client displays timecoded metadata in an easy-to-use format. Different AI engines are displayed in rows with their entries as colored bars showing their position in time. Hover over an entry to see the details, or even enter your own information and feed your correction back to the AI engine to improve it’s results. Our advanced search let’s you search the AI-generated metadata too, so you can quickly jump to the frame a specific event occurs. With all the timecoded metadata returning from AI, we knew it could greatly help video editors sift through hours of footage. 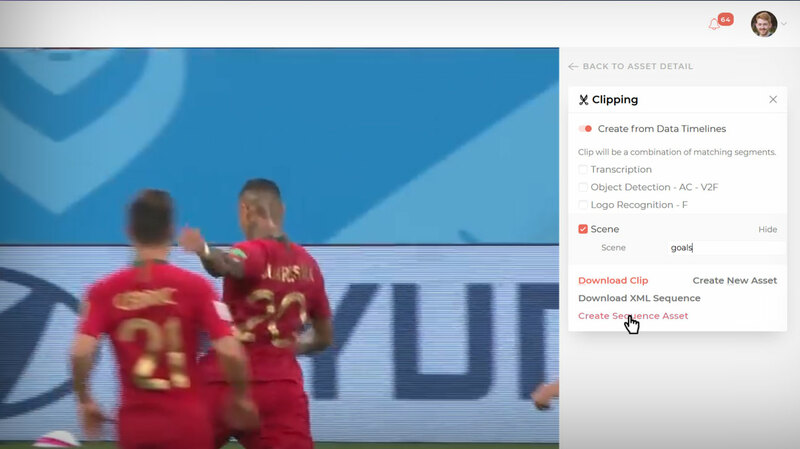 With a few clicks, users can select which metadata values they want (such as goals in a soccer match), and our software will generate an edited sequence of those moments that they can import into any video editing program. Highlight videos will take seconds to produce! We’re just getting started on this feature, and can’t wait to bring even more functionality to it in the future. Many companies struggle with having different departments using different workflows, and nowhere is that more difficult than when one is using Avid Interplay or Media Composer, and the other is using Adobe Creative Cloud apps. To solve this, Evolphin has teamed up with Telestream to offer a seamless workflow to bring Avid media into the Adobe world and vice-versa. 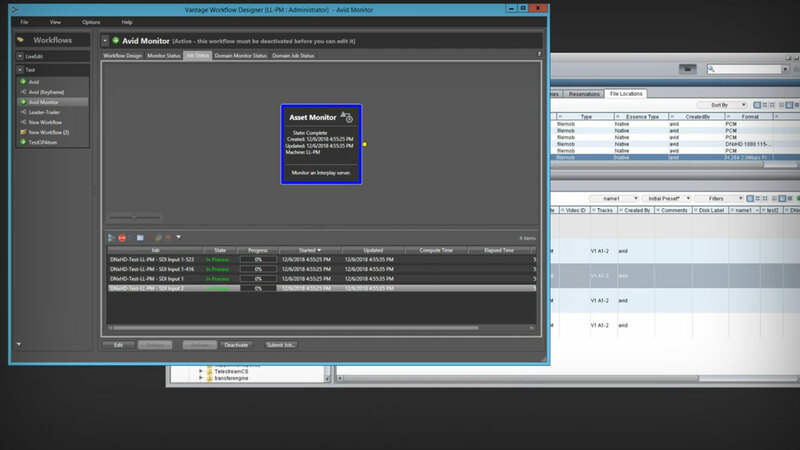 Automatically monitor Interplay bins for new media and sequences, and using Telestream’s Interplay Monitor plugin, the Evolphin MAM is able to extract the media, ingest it, and provide it for usage by teams using Adobe products. For the opposite workflow, designers using Photoshop and After Effects can sync their projects with the Evolphin MAM, and the Avid editors can easily drag and drop the media into their Avid projects. The Evolphin MAM serves as the glue connecting the two worlds, and companies are now able to bring their creative teams into one seamless workflow. For companies with limited infrastructure or remote teams, Evolphin has teamed up with Bebop Technology to provide video editing and creative workflows using cloud-based desktops and cloud-hosted media. 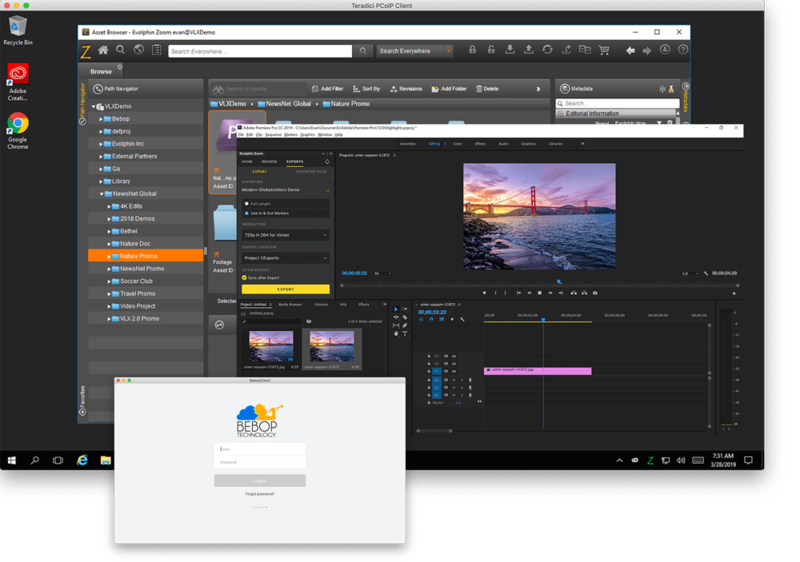 All someone needs is a lightweight client to screen-share into the cloud workstation, and start editing with their cloud-hosted media. They can run our MAM software in the cloud, reaping the full benefits of Evolphin’s version control, powerful search, and real-time collaboration tools. Editors in different parts of the world will be able to access the same content and work on the same projects, without needing to ship hard drives to one another. Evolphin has partnered with File Catalyst to offer built-in high-speed file transfer capabilities, for companies that need to keep different geographic regions in sync with large media files. Users in one city can request the high-res footage from another city, and it will automatically sync between the two locations using File Catalyst’s powerful transfer protocols. You can even specify if media should sync automatically based on certain rules, or if it should only sync when requested. 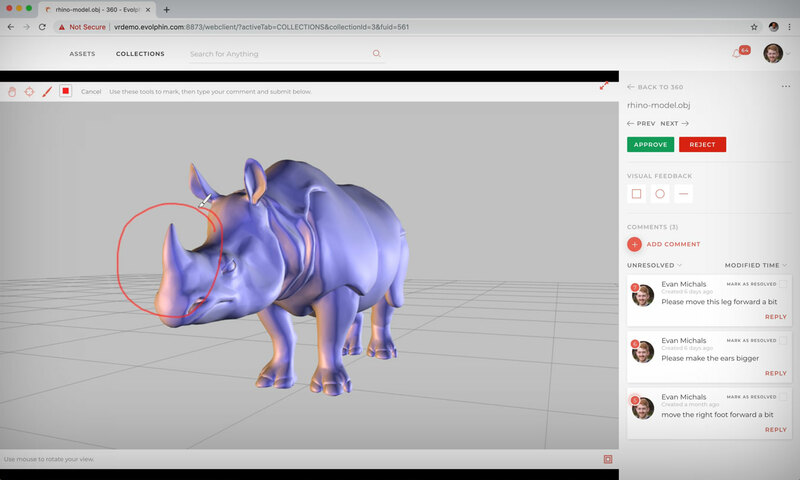 Video game and visual effects artists can now benefit from Evolphin’s collaboration tools and share their 3D models for review. Team members and clients can rotate the 3D models, draw on them, and leave comments, and the artist will be able to see the rotation and markup they left to easily address their feedback. Our plugins for the Adobe Creative Cloud apps (Premiere Pro, After Effects, Illustrator, InDesign, and Photoshop) have improved performance and file status icons for easily seeing what files are offline, online, and on a connected disk. The plugins also show disk mount and auto-checkout status, as well as providing the ability to search in Linked Files. In Premiere Pro, the resolution notifications and switching have also been improved, and now you have the ability to create sequence markers from comments made on your exports! Stop by our booth for live demos of everything!